We can benefit greatly just by using Google. Most of the people REALLY has NO IDEA how to utilize Google to its full potential. And to do this, we are just going to take help from Google’s often little known advanced operators. Allintitle: => this operator is used to search for pages that contain multiple specific words in their title. Example: allintitle:guitar lessons, => this operator is used to exclude results with specific words in them. Example: guitar “post a comment” -nofollow + => this operator is used to include results with specific words in them. Example: music “post a comment” +dofollow. => this operator is used to search for all synonyms of the word directly following it. Example: dog training ~advice (this will also search for terms such as dog training instruction, dog training guide, dog training tips etc…) ..
=> this operator is used to search for a range of numbers. Example: Top 1..99 songs (this will return any post such as top 12 songs). Filetype: – this will allow you to search for just a certain filetype such as a .doc or .pdf file. Example: filetype:pdf dog tricks will find pdf files related to dog tricks. => this operator is used as an OR operator, allowing you to search for keyword1 OR keyword2 Example: best dog tricks|training (Will return results for best dog tricks or best dog training). It is very easy to make slight changes to the search strings and get your desired results. That is what makes it so much fun and rewarding. 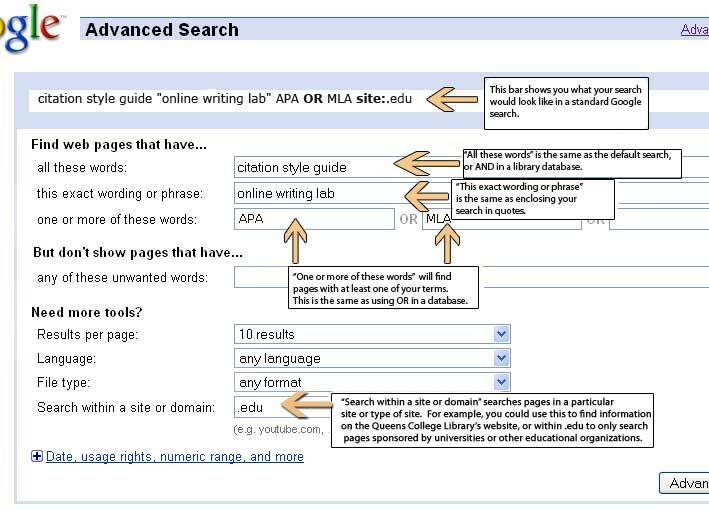 Google does have an Advanced Search Page that many people do not know about or utilizes. But I don’t find it as flexible or easy to use. One thing I always do, once you come up with a good search string, make sure you note it down and save for your future projects. How to use these advanced search operators mixed with footprints ? If you are not familiar with “what footprints are” please read this article. This is best part of this tutorial. I’ll show you few examples of how to combine the footprints with the Advanced Search Operators and come up with seriously powerful backlink finding search strings. Inurl:/register.php “keyword” This string will give you registration pages by using the inurl function to look in the url and the register.php footprint. You can replace the keyword with any keyword according to your niche. This will give you a broad range of results from forums to guestbooks to web 2.0 sites and more. TIP: Very often I just include an additional keyword such as “forum” or “blog” to get more targeted results. captcha -nofollow – It’ll exclude any sites that say captch or nofollow on them. site:.edu “powered by vbulletin” This search string returns all .edu type forums powered by vbulletin. You can also do “powered by SMF” or “Powered by Invision Power Board” or /phpbb2 for finding other kind of forums. inurl:login site:.com “forum” This string searches for .com type sites forums that have login form in the url. Additionally you can add your keyword to find niche related forums. “keyword” forum site:.gov This searches for .gov type forums that contains your specified keyword. I tend to use these next ones more for finding content and doing research, but you can find some great blogs to comment on as well. I just wanted to show you how it works with the few examples above, don’t let that keep yourself from experimenting and finding other great footprints. I don’t want to overwhelm you even before you get started. My hope is that you can see that this is just scratching the surface of what can be done and how to find as many backlinking opportunities as you could possibly imagine. With this knowledge, you can sell backlinking services, build some powerful link juice to your own sites or even sell link packs on Warrior Forum. Whatever you decide to do, the important thing is that you take this knowledge and TAKE ACTION. This entry was posted in SEO and tagged advanced operators, Advanced Search Page, Allintitle:, footprints, Google Search Operators, results with a single specific word in the page title, results with specific words anywhere in the page text, search for pages that contain multiple specific words, search operators, search strings, site:yoursite.com, what footprints are. Bookmark the permalink. Follow any comments here with the RSS feed for this post. Post a comment or leave a trackback: Trackback URL.